Work is now complete on Roncesvalles Avenue, and it is open for streetcar service. Starting June 25, carhouse trips for the Carlton and Dundas routes will resume via Roncesvalles, but the 504 King bus shuttle will remain until July 30 because that is the next regular change in TTC schedules. It is possible that some streetcar shuttles may appear, but the TTC’s press release is a bit vague on the details. The TTC’s route diversion page for King has not been updated to reflect the change. Brother, Can You Spare $500-million? The board of Toronto Transit Infrastructure Limited (a TTC subsidiary) met today to consider various matters, among them the need for more money. Paul Maloney of the Star covered the meeting (I was unable to attend due to a conflict elsewhere). Although it’s early days, we now know that the projected cost of the subway has gone up from $4.2 to $4.7-billion. Just to pay for that increase would take over 10 years’ worth of development charges levied in Toronto. It is amusing to note that a subway touted as a “private sector” undertaking would be funded largely by new taxes and public sector money. 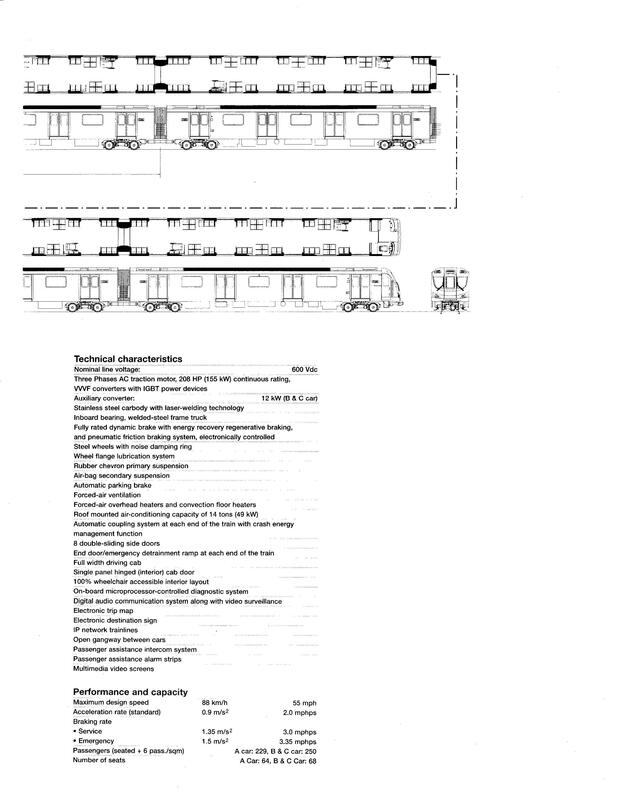 The Sheppard subway fantasy will, no doubt, become even more bizarre as details unfold. Chong plans a report to Council in fall 2011. Meanwhile, he estimates that the preliminary work needed to determine the cost and feasibility will set TTIL back up to $300-million. Maybe they can start pre-selling sponsorships for the stations. After all, condo developers understand the concept of selling vacant land. Buy early! Get ’em cheap! Updated June 20 at 2:45 pm: The York Quay Neighbourhood Association issued a press release detailing a meeting between many interested parties and a representative of Mayor Ford’s office. There is very strong support among residents and businesses on Queen’s Quay to get this project underway without it being entangled in political or bureaucratic bungling. Congratulations to our neighbours in Kitchener-Waterloo for embracing an LRT line in their city. Unlike Toronto, with a would-be Mayoral dynasty whose grasp of transit and municipal finance can be breathtakingly mean and shortsighted, K-W has decided to proceed with a rail spine for its transit network. Now is the time for Queen’s Park to accelerate support for LRT in Mississauga and Hamilton. Get off the pot and show people what surface rail transit can do. Read details in The Record. More info on the Region of Waterloo site. So You Just Bought A Subway Station! Let me be the first to congratulate you on buying the naming rights to one of our fine subway stations! You’re probably wondering if there are extras in the contract, things you should know about your new home. We’re sorry about the holes in the walls. The stations are getting on and we suspected that there might be problems, so we took a look. We will put the walls back in April, June, September, maybe next year. Have we asked you about sponsoring the walls too? We’ve cleaned up a lot of them, but every little contribution helps! The ceilings are a bit grotty in a few stations. We were planning to fix that too, but a scheme to develop a new easy-to-maintain ceiling tile system was cut from our budget. Could we interest you in sponsoring that? The collectors’ booths are a bit of a mess in some stations, and we know all those posters don’t look nice, especially the ones that are a few months out of date. We’re working on it. Could we interest you in buying poster space on the booths? We really would rather sell it to you than put useful information on them, and our only request is that you leave an opening so that riders can talk to the collector. Signage. Yes, we know. Our signage isn’t the greatest in some stations, but we look on this as a museum of design. This is Toronto, and artsy-fartsy stuff doesn’t count for much here. We are prepared to take down all of the signs and replace them with new ones in your corporate colours and typeface. We regret that this is an extra charge option. Announcements. All station announcements will include your company name, and a short message, changeable monthly, tailored to a specific campaign. In keeping with our practice on print advertising, we will ensure that the new messages are posted on our trains no later than two weeks after any special offers are no longer valid. For a small added fee, we will include your logo on our transfers. They are sure to become collector’s items! This offer will end once the entire system converts to Presto smart cards, but the more affluent among you could afford to sponsor that entire subsystem. Please talk to our friends at Metrolinx about regional sponsorship opportunities. Escalators and elevators. Your contract does not include any guarantees that the vertical transportation elements within your station will be reliably operating at any time. We regret that this could produce a poor impression on some target audiences. To compensate, we invite you to sponsor one of our Wheel Trans buses. Our trains are an important part of the transit system, and we will endeavour to have them pass through your station reasonably often. Although service may at times be irregular, this gives you an opportunity to market to a captive audience. Video advertising screens will be programmed to launch special advertising campaigns when there is an extended delay. We regret that the shiny exteriors you saw in our brochure only are available on brand new equipment. Older cars are washed as and when we can get them to the one working car wash in our system. If you have purchased exterior advertising on our trains, we regret that it may not be legible or attractive to your target audience. Our plans for platform doors will completely eliminate the need to wash train exteriors, and this problem will solve itself in a few decades. Are you wondering why your station doesn’t have your name on it yet? We’ve issued the work order, but there have been problems with co-ordination and we hope to have the station looking bright and new to your specifications in a few months. Trust us! What? You’re want a refund? The TTC has announced that the July Metropasses for subscribers will not be mailed out. Instead, all customers who normally receive passes in the mail and pay by automatic bank withdrawal should buy a pass at the regular price. They will receive bank credit for the difference between a pass on subscription and one bought at a station. Extra stocks of passes will be at collectors’ booths and in pass vending machines. For full info, please refer to the TTC’s site. For several views of the excavation work now underway in the west wing of Union Station, please visit The Grid which has a photo gallery from a recent press tour. And Urban Toronto is particularly good. Updated June 9 at 12:01 am: During discussion of the preliminary budget at the June 8 TTC meeting, staff repeatedly noted that all estimates are based on current Service Standards which drive the quality of service to be provided in the face of growing demand. This is a troubling state of affairs because we will almost certainly face a proposal to cut service quality by amending the standards as part of the 2012 budget process. The last thing the TTC needs is a return to a there’s-still-room-on-the-roof planning which is a guarantee for declining customer satisfaction and employee morale, and for strangling ridership growth. Chair Stintz made reference to the level of rider subsidy and observed that it is uneven across the system. Would new standards be imposed that would trim routes and periods of operation beyond what already happened in May 2011? The Commission desperately wants to preserve service (one of Rob Ford’s campaign slogans), keep costs down, and yet somehow squeeze much of the cost savings out of “efficiency”. This is simply not possible, especially if Council imposes a cutback in the TTC’s operating subsidy. Combining the known shortfall in the 2012 budget, the likely pressure from wage increases of the now-essential TTC workers, and a potential subsidy cut, there is a gap of over $100-million. A good chunk of this is directly traceable to the short-sighted decision to freeze fares and eliminate the vehicle registration tax in 2011. Another large contribution comes from the expected 1/3 increase in the cost of diesel fuel. Management has been asked to look at opportunities for staff cutbacks that will not affect service, and this means that any cuts will disproportionately hit support services that make up a small proportion of the total organization. Moreover, even assuming cuts can be found, this is a one-time fix and the cost pressures will return in 2013 and beyond. Options to be reviewed include contracting out and sharing functions with the city. It is unclear whether some Commissioners have grasped the idea that increased crowing on buses is a service cut, or if all they care about is that some transit vehicle wanders by now and then to preserve a fiction of service. The timetable for finalizing the budget will see a report to Council in September with options for the TTC budget, and a final version, based on Council’s direction, to the TTC board in October. The original June 8 post follows the break below. An interesting tool for viewing transit travel times in many cities is available at Mapnificent. Using schedule data published by many transit agencies, you can view the area to which someone can travel within a given time, on a specific type of day and day of the week. Playing around with the parameters gives different views depending on available transit services, walking time to stations/stops, and of course, your location. The route/schedule information appears to be a bit out of date because late night Sundays still show transit access via routes that no longer operate. There doesn’t appear to be a provision for the effect of waiting time at stops. If a bus runs half-hourly, and you want the “15 minute” travel boundary, then most of your average trip will involve wait time. According to the comment thread on a post linked below, no wait penalty is assigned for the route at the start of a trip, only for transfers along the way. All the same, it’s an interesting way of looking at transit travel and comparing the reach transit provides in different parts of Toronto and the GTA. Something like this would be ideal for visualizing proposed transit networks if one replaced the transit system as it is today with “tomorrow’s” version. Have fun playing with the site. Note that this is a beta version, and some things may not work quite as advertised. Also, note that this is a very cpu-intensive application, and changing the display parameters may take a while for the update to complete. 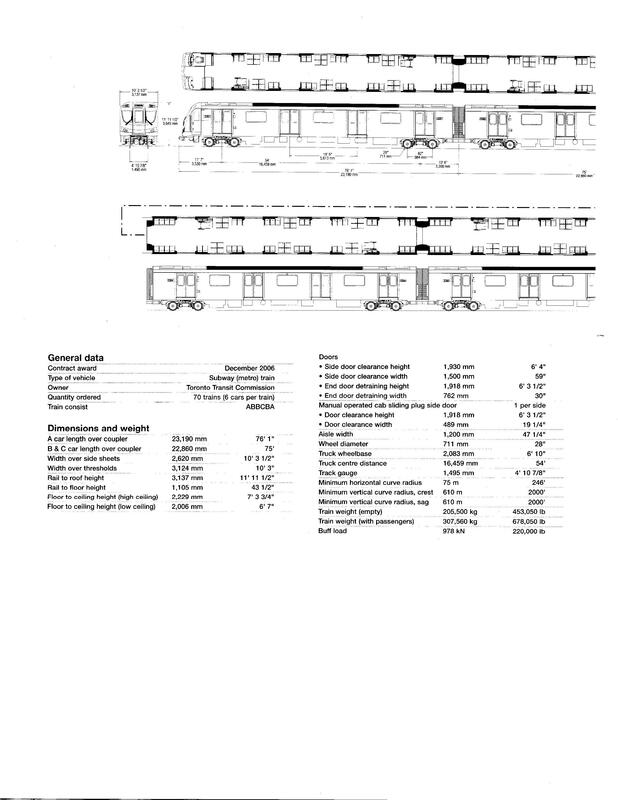 Updated June 4 at 4:10 pm: In response to comments about the lack of a handout at Doors Open when the new cars were on display, I have scanned two pages from the Bombardier handout showing the train layout and technical specs.